My iPod had themes on it back in the day of Installer and SummerBoard (which feels weird to say, though it would have been five years ago). Saurik’s WinterBoard is a different (but compatible) animal. WinterBoard themes change more than just your iPhone’s skin, they can even modify system sounds. With Default Lock+Unlock+Charging Sounds you can banish some of the goofier sounds that your theme might have been packaged with. Cloning the lock, unlock, and charging sounds that come with your iDevice seem like an odd move. After all, why set a sound on your iPhone that’s already there? Turns out it’s actually a clever workaround when you don’t want the sound effects that come with a theme. All you need to do is install this “theme,” open WinterBoard in Settings, then go to your themes and select Default Lock+Unlock+Charging Sounds. The default lock, unlock, and charging sounds will override anything else. I’ve fallen out of the habit of using WinterBoard. Since iOS 5.0, Apple allows background images by default, and I find that the themes which include custom icon skins look cool… until you download an app which has an icon the the theme doesn’t support. Then the themes just look goofy. The problem is at 500000 apps, no handcrafted theme can support them all. You’re going to have mix and match. But having an option to remove some of the goofiness from WinterBoard themes is always welcome. My only complaint is that I can’t individually select the default lock, unlock, or changing sounds from the package, I have to apply them together. The extra level of customization would have been a benefit. 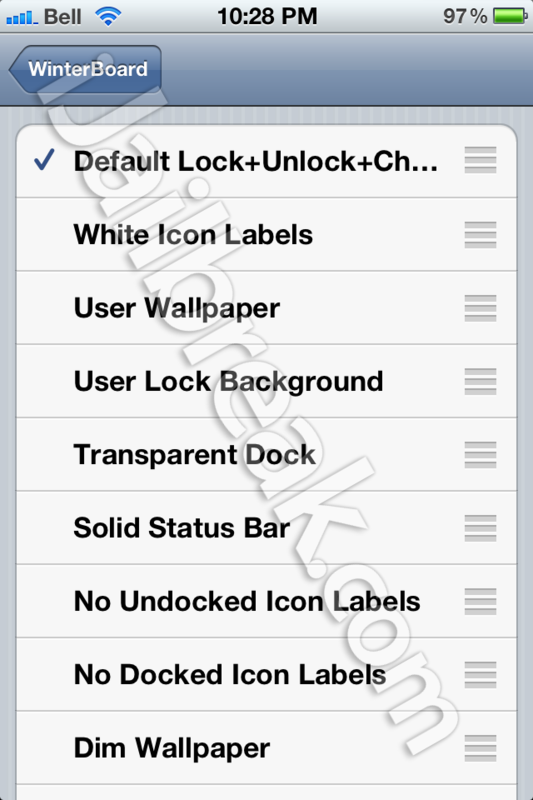 Still, if you’re looking to keep those three sound effects with your favorite theme, Default Lock+Unlock+Charging Sounds is available from the BigBoss repository on Cydia for FREE. What’s the goofiest sound you’ve heard on a SummerBoard theme? Share the onomatopoeia in the comments section below. So break each sound out into its own theme. Done.